At the Source step of the wizard, select one or more physical or virtual machines for which backup files should be restored. If you have chosen machines to restore from archives on tape, the list of objects to restore will be populated with selected machines. From Hyper-V Infrastructure — this option is available for VMs only. Browse the virtual environment and select VMs to restore. If you choose a VM container, Veeam Backup & Replication will expand it to a plain VM list. To quickly find a VM, use the search field at the top of the list: enter the VM name or a part of it and click the search button on the right or press [ENTER]. 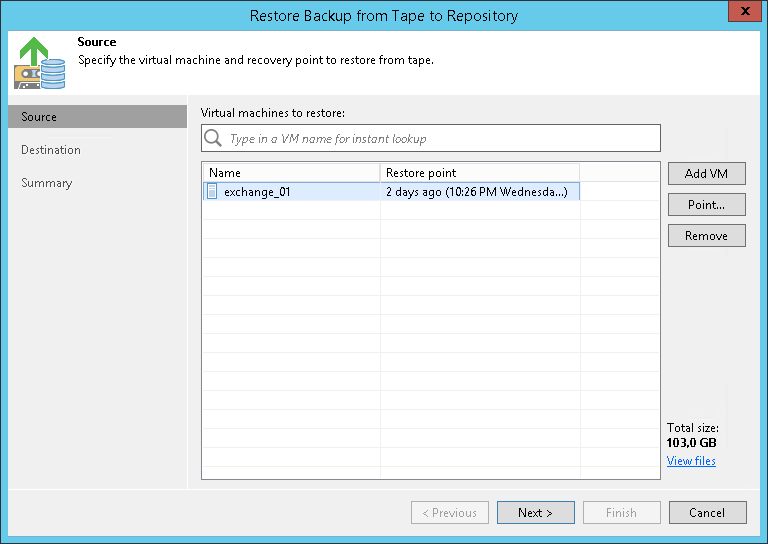 From backups — browse existing backups on tape and select machines under backup to tape jobs. To quickly find machines, use the search field at the bottom of the Select Objects window: enter a virtual or physical machine name or a part of it and click the Start search button on the right or press [ENTER]. To remove a machine, select it in the list and click Remove on the right.